Welcome to Mercedes-Benz of St. Charles. 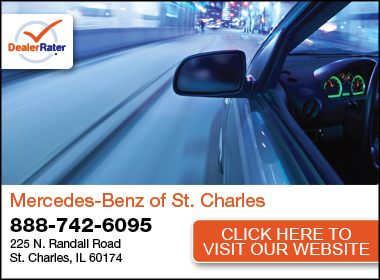 Located at 225 N. Randall Road in St. Charles, IL, we are dedicated to offering a wide selection of new Mercedes-Benz and pre-owned Mercedes-Benz vehicles for you to choose from. We pride ourselves on our knowledgeable and friendly sales associates who always offer a no-pressure sales environment. Our straightforward buying process will get you behind the wheel of a Mercedes-Benz in no time. Mercedes-Benz of St. Charles is the proud recipient of the prestigious Mercedes-Benz "Best of the Best Dealer Recognition Award" for 2012 Mercedes-Benz of St. Charles has received the prestigious Mercedes-Benz Best of the Best Dealer Recognition Award based on its outstanding performance in 2012. The award was presented as a tribute to its success as an independent entrepreneur who routinely exceeds the expectations of Mercedes-Benz owners. The award, which is presented annually, goes to top performing Mercedes-Benz dealerships for demonstrating superior performance in various areas of their business, including customer satisfaction, new vehicle sales, certified pre-owned sales, leadership and management, parts operations, and market penetration. "These dealers are exemplary representatives of the Mercedes-Benz brand: an entrepreneurial spirit fueled by a commitment to excellence and strengthened by a total focus on customer satisfaction," said Steve Cannon, president and CEO of Mercedes-Benz USA. "Supported by their exceptional performance, 2012 proved to be one of the most successful years in the history of Mercedes-Benz USA. I thank them for their hard work and dedication." Mercedes-Benz of St. Charles is the only Mercedes-Benz dealer in the State of Illinois to receive this prestigious award for 2012.